The Square Peg - Oh No... You Did NOT Just Do That! Oh No... You Did NOT Just Do That! My back yard has grass deep enough to hide a small lion. Okay, maybe that’s an exaggeration, but it would hide a large house cat. Yep... it’s still raining in South-central Texas. You see, I didn’t get to mow the back on Friday. Got the front once it dried out from the previous night’s rain, but when I got done it was too late to mow the back. Saturday... forget about it. It rained Friday night and again Saturday afternoon. Then it rained Sunday... and again on Monday. Now it’s Tuesday and, you guessed it, more rain. Tomorrow... more rain. Thursday... more of the same. Friday... you got it. Things in Texas are flooding. Heck, even my dry creek bed out back had rapids in it. If it keeps up, I won’t have to go far to go fishing. Rain, however, does not stop some people from mowing their lawns. And by “some people” I mean Bingo Bob. “Nothing,” he claims, “will stop” that behemoth of a riding mower he has. I’ve even seen him run it when there are areas on his lawn with an inch of water on them. Old Bob just fires his monster grass saw up and charges forth. Yep, he was out there this morning. The sprinkles preceding the deluge didn’t bother him. He’s got an umbrella mounted over the cockpit of that chunk of green-eating mammoth. I saw Paula Pettingzoo approaching Bob’s property just as he made a turn and headed back toward the sidewalk. I didn’t even have time to yell a warning, not that it would have done any good. All that water Bob has been mowing this year has rotted his muffler. Bob, naturally, wasn’t paying any attention to anything outside of his aiming point. He didn’t see Paula, not that he would have stopped even if he had. One thing you have to understand about Bob’s mower. It has a side discharge that kind of works like a snow blower. It spews clippings out at an alarming velocity. It’s like a vegetative blizzard when he goes by. Paula saw Bob and tried to increase her pace, but that fiberglass boot she had on was slowing her down. I’m guessing she won’t be messing again with stray Chihuahuas that don’t want to be rescued any time soon. Now, ordinarily, a person can just turn away and avoid any serious damage from Bob’s flying Bermuda, but that doesn’t work when the grass is wet. Wet, heck, it was downright sloppy. That old mower was spraying out green puke. It caught Paula full on as he roared by. I reckon he heard that shrill shriek she let out. Nuts, the whole neighborhood heard it. It was louder than Bob’s mower. Bob shoved in the clutch, brought the machine to a stop and then switched it off before turning to look back at what he’d just done. 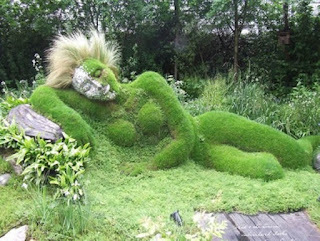 Paula looked like that monster Grass Man they keep talking about in Ohio... except the curves were wrong. Nobody would mistake Paula for a man. Never-the-less, poor old Paula had been knocked down by the blast and was completely covered in about 4 inches of dripping wet grass. There wasn’t a single part of her that wasn’t... except her eyes, and they were blazing. I mean it... they were seriously blazing. I don’t think I’ve ever seen brown eyes that looked like fire and hers did. I think if I had been Bob, I’d have fired up that old mower and ridden it as far and as fast out of her path as I could. But then I’m not Bob and Bob sure as heck isn’t me. I’ve got common sense and I’ve seen what irate females are capable of! Paula was not amused. Matter of fact, that just kind of stoked her fire. I’ve never heard Paula swear like that. Come to think of it, I don’t think I’ve ever heard what was coming out of her mouth from any other woman I know. It was enough to make sailors blush. Heck, it made me blush and, frankly, I have a pretty broad vocabulary. Walking cast be hanged... it suddenly became a running cast. Shoot, I didn’t know Paula could run that fast... even without a cast on her foot. I was going to offer to hose the grass off of her, but all I heard was clop-squish, clop-squish, clop-squish as she disappeared down the block. I just looked at Bob as Paula faded in the distance. He shrugged a little, palms held outward, grinned just a little more evilly than I thought was appropriate, and turned the key on his monster mower. The Square Peg - I’m Depressed... and I Like It! Yep... you heard me correctly. I like being depressed. 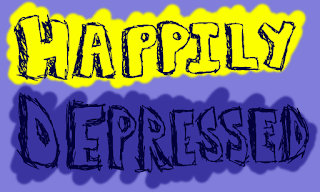 I’m more creative when I’m depressed. 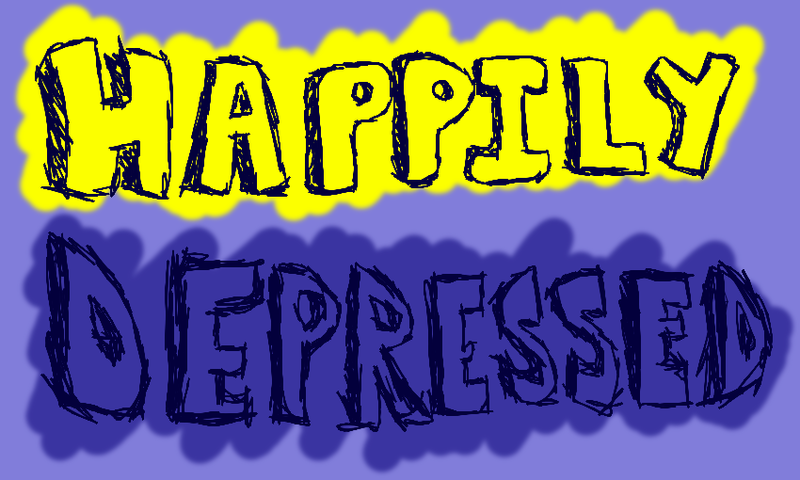 I get more done when I’m depressed. It’s a great state to be in. Just so you know I’m not talking psychologically depressed here. I’m talking physically depressed. Not my body, silly... my clothes. Perhaps I should explain. You see, I spent some thirty years dressed in neatly ironed and stiffly starched shirts, business nooses (for you uninitiated, that would be a necktie... and there’s a reason they called hangings necktie parties in the old west), and smartly tailored suits or slacks and sport coats (depending on the occasion). Yep, I looked professional and that’s important when one is in a profession... especially if one wants to get ahead. And there were rules, perhaps unwritten, but rules none-the-less. For example, you don’t wear brown shoes with a black suit or black shoes with a brown suit. I don’t know who came up with that, but there it is. Then there was that shirt color and matching tie thing. Apparently one does not wear a purple shirt, no matter how well-starched it is, with a light gray suit and an electric blue and rose-colored tie, even if your wife did pick it out. That’s a fashion no-no in the business world. And, no matter what else you do, don’t wear loud patterned argyle sox with anything unless it happens to be a fashionable set of knickers on the golf course. Golfers will tolerate, and even encourage that kind of eccentricity. There’s a different code and set of rules on the fairways and greens. I’ll save that for another discourse. On the other hand, I was a bit of a maverick. There were some things to which I just wouldn’t conform. Take shoes for example. I didn’t wear them. No, I didn’t go barefoot; it wasn’t Hawaii for Pete’s sake. I wore boots. I mean real boots, not those zip up the side, designer specials that some young bulls favored... I mean Tony Lama’s, Dan Post’s, or Justin’s with combination riding-walking heels and pointy toes. They were a hangover from my younger days... and they were the only things in which my feet were comfortable. Besides, I liked the way they looked and they were terrific for smashing spiders in the corners of hotel rooms, although I tried not to do that unless they were aggressive and bent on annoying me. Thankfully, I didn’t have to use my spider shoes, as my eastern colleagues were fond of calling them, very often. I stayed in pretty nice hotels except when I visited the military bases where I had contracts. You kind of take what you can get there. Anyway, I only was able to get depressed on weekends when I was working. That, in and of itself, was kind of depressing... and I mean that in the psychological sense. But at least I was freed of that GQ pressed look for two days a week. I’m telling you, it was liberating. Nothing like a wrinkled tee shirt and wrinkled shorts or jeans to get the old weekend juices flowing. We’re talking comfort here... pure blissful comfort. The older and more worn the garb, the better I liked it. Still do... except my lovely gets rid of the ones with holes in them... you know, the well-broken in ones. Sigh. I still miss my old Reese’s Peanut Butter Cup tee. It was my favorite when we got married. It disappeared in less than a year. She tried to make amends... tried to get me to buy a new one when we went to the factory in Hershey, PA. It wasn’t the same. I told her it would be like me throwing out her prom dress and then telling her to buy a new one. Apparently that is a horrible thing to say, so now I just keep my mouth shut... most of the time. “It’s liberating!” I fairly shouted. “I know a good shrink,” he replied, shaking his head. I’m pretty sure his better half starched his underwear this morning. Eureka! I finished the shoe rack. Bring on the boat. Oh, wait a minute... it rained all week long. The aquifer is up 20 feet over last year. All of the reservoirs are full. As a matter of fact, they are over-full. They’re letting water out into the rivers, which are already running full. I might just have to build a boat for self preservation. Maybe it ought to be an ark. But, before I can start, I have to hay my yard. Yep, you heard me right... hay it. While it was raining, I could actually watch the grass grow. And, boy, did it grow! I try to keep my lawn at 3 inches. It’s kind of the ideal height down here. It holds the water and stays green. I measured it before I started to mow. Nine inches. Are you kidding me? Six inches of growth in a week? Holy crap! I prepared to do battle. I filled the gas tank. I checked the oil. I cleaned the air filter. I sharpened the blades. Then I rolled out the machine. Intent as I was on doing battle with the green monster, I didn’t hear the footsteps behind me. I must be slipping. “Gonna mow the yard?” Bob’s voice startled me and I jumped a little. Now, I know for a fact that Bob’s mower has been in the shop more times than it’s been out. And I’ll grant you he has one of those big self-propelled jobs, which is kind of overkill for the postage stamp yards we have, but he abuses it. For one thing, he has a tendency to forget where he’s put stone edging and hits the stones with regularity. I’m not talking pebbles here; I’m talking six-inch thick, foot and a half long, and a foot wide. They really shouldn’t be that hard to see. I looked at his blades one time when he was complaining that it wasn’t cutting right. They look like a big gator had taken a bite out of them. He routinely clogs his air filter and doesn’t clean it out. I cleaned it for him twice, once to get the mower running and once to show him how to do it himself. The next time he asked me to help fix his machine I told him I was going to start charging. I’m not mean, but then I’m not Beldar Conehead either. (For those of you who haven’t seen Coneheads... rent the movie). “Oh man... you smacked his baby? You’ll be lucky if he talks to you in the next year.” Duncan’s truck was his pride and joy. It’s a big one ton with dual wheels on the back. What’s worse, it’s his hunting truck... and I know he was planning on hunting Rio Grande turkey this weekend. Uh-oh. “Yer not helping,” Bob groaned. “I can’t do a thing for you, Bob.” I bent over grabbed the pull cord and gave it a yank. The mower roared to life. I didn’t even look back, although in my mind’s eye I could see him retreating with slumped shoulders. I was sure Duncan would get over it... he’s not one to carry a grudge, but making Bob feel miserable when he does something stupid like that brings Duncan enormous pleasure. I just hoped Bob had good insurance coverage. I’ve been told that I’m set in my ways. Not true... well, mostly not true. There are some things I would prefer didn’t change. However, I am pretty flexible in most areas, and where I’m not flexible, at least I’m adaptable. For example, some folks my age have no real sense of adventure any more. They find nothing so comfortable as settling into some place and becoming home bodies. Not me. I like to travel, especially to places I haven’t seen before. Now, I will grant you that there are some places I’d rather not see. I mean who wants to see Detroit decay? Not me. If, however, you mention an out of the way spot in Podunk, Montana where I can go pry up rocks to look for fossils... well, heck, who wouldn’t want to go there? Besides, there’s likely to be a fishing spot somewhere nearby. Man, that’s like a double jackpot! Here’s the deal, we are a mobile society. We move... a lot. Take me for instance. I’ve moved no less than twenty times in six different states. Mostly the moves were work related, although not all. Also, for a good stretch of my career a colleague and I were fond of saying our second home was a Boeing 737. Buying a home is supposed to settle you down. It doesn’t. Nor does it remove the itch in the feet. Just ask my lovely. Anyway, this means that cities, towns, and neighborhoods are in a constant state of change. People move in... people move out... new people move in... and on and on. In south central Texas, especially in San Antonio, more people are moving in than are moving out. That creates a great sellers’ market, by the way. In our neighborhood we have a pretty good mix of folks, including most colors of the ethnic rainbow. It’s kind of like a mini-cross section of America. We’ve got retired folks, we’ve got young professionals, we’ve got young families... and we have liberals and conservatives, although the balance tends toward conservative simply because SA is home to a lot of military bases and military families. On the other hand, we have some rabid liberals. When rabid liberals and rabid conservatives get together you might expect fireworks, but most people just avoid talking politics... with the exception of Bingo Bob and Duncan Donutz, and even they put differences aside if there’s a golf outing or fishing trip involved. There are some things just way more important than politics. A couple of days ago I found out we’re losing a good neighbor. They’re being shipped off to Japan. I’ll miss them, but we’ve had a good run together. We also got a new neighbor about a block away. Somebody told me his name was Frank. 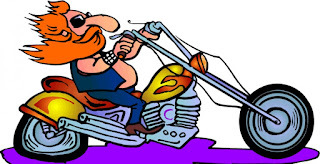 The first time I saw him, he came roaring up on a big Harley Davidson, whizzed by me and left my ears ringing. Frank isn’t a youngster... at least not age-wise. 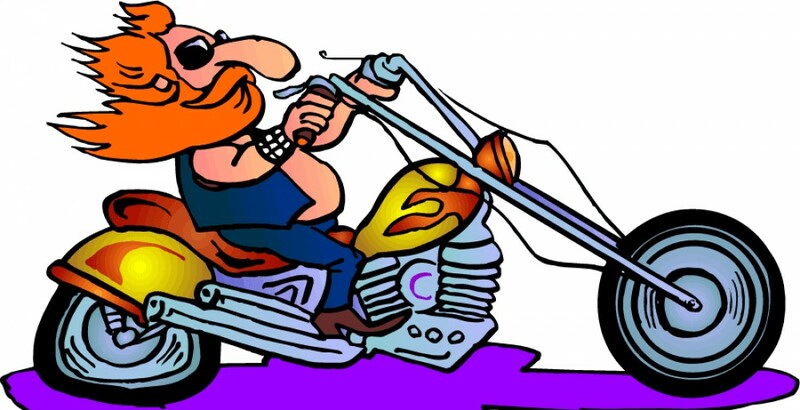 As he flew past me on his hog, long, silvery locks flowing back, I had a brief look at his leather club vest, but he disappeared down the block before I had a chance to read it. I don’t think it belonged to some outlaw biker gang... I mean the only thing I saw on the back was this big green duck with some lettering around it. How bad can that be? Yesterday he zoomed past me in a shiny, mint condition 73 T-top Corvette with a gorgeous, long maned blond in the passenger seat. She even tossed a kiss at me as they went by. I’m thinking to myself, “Midlife crisis.” Yeah... I know that’s kind of judgmental coming from a guy who married a woman who is fourteen years younger. I’m happy, so sue me. At least I didn’t run out and buy a hog and a ‘vette. Shoot, I even traded my Lincoln in on something more practical, and I loved that Mark V. Oh well. Besides, this isn’t about me... it’s about Frank. I’m not sure whether Frank has a job or not either since he seems to be coming and going during the day. A lot. Who comes home at ten o’clock in the morning and has a regular job? Okay, maybe I’m being a bit old fashioned here. I know all about telecommuting. Heck, I did it for about two years. The thing is I wasn’t ducking out for a ride at one, three, and five. And I wasn’t coming home at two a.m. I’m not really spying on old Frank, but the racket that Harley makes is hard to miss, not to mention the glass pipes on the ‘vette. “Works for me,” I replied. “Does anybody care if I bring the Colt?” I have to ask this because the Colt is an old Navy .44 caliber black powder gun. Some folks don’t like them and I didn’t want to offend Frank before I had a chance to get to know him. I mean, how bad can a guy be if he likes to go shooting? Uh-oh. You know what this means? It means I have to revise my thinking about the new guy. Anybody who shoots black powder guns is a kindred spirit. I started to wonder what else we might have in common. Duncan let me know before I had a chance to ask. About twenty minutes later, Frank and Duncan pull up in front of my driveway in a steel-grey Hummer, Duncan wasn’t kidding when he said it was new. It still had the temporary plates on it. Frank got out and came around the rear. “Hi, I’m Frank,” he said sticking out his hand. The grip was firm... eyes steady. On the way out and the way back, I learned a lot about Frank. I learned that he had raced motorcycles when he was young. He must have been reasonably successful at it because, even though he admitted he had raced Yamaha and Kawasaki bikes for the most part, he had made enough to buy a Harley dealership. Then another, and then another. Texans don’t go small. In any case, after years of hard work, he now had time to enjoy the fruits of his labors, and he intended to enjoy them to the fullest. Oh, and I found out about that gorgeous blond. Turns out it’s his nineteen-year-old daughter who is attending UTSA. Oh, and we found out Frank’s last name. It’s Furter... Frank Furter. Kind of figures, doesn’t it?